Escrow closed on the entire town of Harmony on June 20. San Luis Obispo and Texas residents Alan and Rebecca Vander Horst purchased the coastal town located along Highway 1 between Cayucos and Cambria. The Vander Horsts bought Harmony from the Mehdizadeh family, which resides in Los Angeles. Parties involved would not disclose the purchase price. Alan Vaner Horst, a dairyman and Cal Poly graduate, said he wants to restore Harmony’s historical buildings. A spokesperson for the Mehdizadeh family said it was too difficult to maintain the town while living in Los Angeles. Attractions in Harmony include a winery, a café and a glassworks gallery. The Vander Horsts are considering adding fine dining, a dairy farm, an artisan cheese shop and an ice cream parlor. Town residents would like for the U.S. Postal Service to return. The Harmony post office closed in 2008 after being in operation since 1914. Cindy-the post office used to do quite well when my parents owned it in the 1980’s-1990’s. They opened a wedding chapel and many wanted to email their invitations from there. My husband and I were married in Harmony. It was a great little town back then. Cindy- actually the post office did very well when my parents owned the town back in the 1980’s-1990’s. They opened a wedding chapel that was very successful. Many people came especially to have their invitations, cards, etc. mailed from Harmony. My husband and I were able to be married there as well. These days most people routinely say what they want to do, how about getting back to the time when people could say what they will do? went there to look at the piano, fell in love with the town, and ended up buying both. The food at the cafe then was actually pretty awesome. I still have that my dad bought me from Harmony. I remember Ginny Moore. She ran the restaurant for several years. 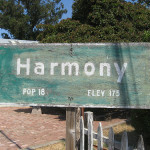 The little town of Harmony sounds charming especially if they add the additional retail locations. I’ll certainly stop by for some ice cream especially if it’s made from the local dairy products not to mention some cheeeeeeeeeese (yum) to take home ! I’m surprised the US Post Office stayed as long as it did with only 18 residents however I’m reminded of a post office in little town of 10 people out in the Cayman Islands. They make a fortune selling post cards which people then mail with the name of the town postmarked on it. I mailed a few myself as I couldn’t resist. The name of the little 10 person town is called HELL.